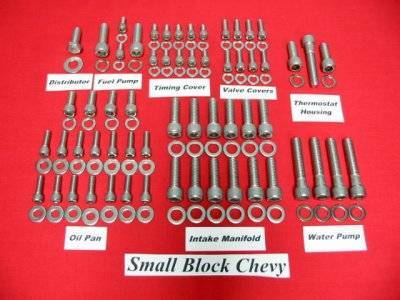 Give Your Small Block Chevy Engine a new look with our Stainless Steel Allen kit!! Our special intake washers are 1/8 thick. The bolts in this kit are made from 304 stainless steel. We are aware that there are many combinations of parts that could be used to build your engine. Let us know the following information when you place an order. Is your water pump long, short, or electric? We send bolts for the Long water pump standard. Aluminum valve covers, oil pan, timing cover? Fuel pump block off plate? We make these kits to order, so if you let us know what parts you are using, we can custom make a kit to fit your engine. The carb stud kit fits Carter, Edelbrock, or Holley Carbs. The studs have an internal hex used to install them in your intake manifold. If you are using a Quadrajet carb, just let us know and we will include a mounting bolt kit for you!